When done in the right color, even the simplest pieces take on a fashionable flair. Such is the case with our Bronilly nightstand. Bright, white knobs and accent trim create just the right amount of contrast. Hidden USB charger makes this the perfect perch for your electronics. Smooth operating drawer keeps your essentials close at hand. 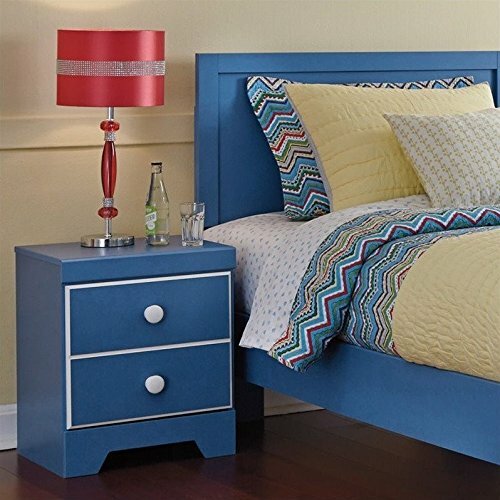 The Bronilly Collection is an assortment of replicated blue paint with white trim and accents. Optional rolling trundle/storage box provides versatile function. Fun asymmetrical dresser format offers deep storage drawers. Headboard legs have four height options for optimal relationship to bedding height. Side roller glides for smooth operating drawers. Large white wood knobs. Slim profile dual USB charger located on the back of the night stand top. Designed to bolt to a standard metal bed frame. Features: Finish: Blue; Material: Engineered wood; Style: Metro Modern; Includes: Power cord (UL listed) and 2 slim profile USB charging stations; Number of drawers: 1; Assembly required. Specifications: Overall Product Dimensions: 22" H x 18.5" W x 15.5" D ; Overall Product Weight: 37 lbs; Drawer Interior: 8.25" H x 15.25" W x 13" D; Warranty: 1 year.